Each of us, physically speaking, is little more than a big bag of water. Think about it ... why doesn't it all flow down to our legs when we stand up? Actually it does. Or at least it tries to. It doesn't happen though because our autonomic nervous system directs the blood vessels in our legs to contract so as to send the blood back up to our brain and muscles where it's needed. If it didn't, the effect would be similar to rapidly losing several units of blood. When this process doesn't work properly, your blood pressure can significantly drop when you stand upright for an extended period. This can result in a low-blood-pressure condition called "Neurally Mediated Hypertension" (NMH) or a compensatory rise in heart rate called "Postural Orthostatic Tachycardia Syndrome" (POTS). 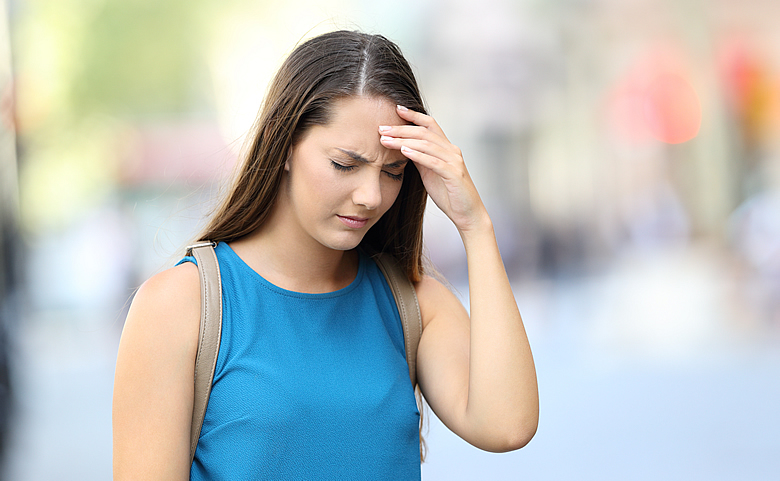 Whatever you call it, it falls under the umbrella of orthostatic intolerance (OI), a condition that causes dizziness, exhaustion, and a sense of "brain fog" in people after standing for awhile. OI is a major, yet common and very treatable, part of what causes disability in CFS and fibromyalgia. In fact, research has shown that many people diagnosed with NMH and POTS actually have CFS or fibromyalgia. The good news? OI, POTS and NMH are VERY treatable! The hypothalamus is a "circuit breaker" in your brain that controls energy for key functions within your body, including blood pressure (autonomic function). In people with fibromyalgia, this brain structure malfunctions. Because of this, autonomic dysfunction is routine in fibromyalgia and contributes markedly to symptoms. Many people with fibromyalgia will stand for a few minutes ... blood will rush to their legs ... their tissues won't get adequate blood flow ... and they'll feel wiped out and brain fogged. The standard approach for diagnosing orthostatic intolerance is to use a Tilt Table Test. However, that test is unreliable, will make you miserable, and your insurance company will probably not cover it, which means leaving you stuck with what's likely to be a $2,000 bill. An easier approach is provided by a wonderful study published in the Mayo Clinic Journal that showed that a simple quiz can be quite reliable. It's free and takes only a couple of minutes to complete. Circle 0-4 below as best applies to you. My orthostatic symptoms severely interfere with activities of daily living (e.g., work, chores, dressing, bathing). I am bed or wheelchair bound because of my symptoms. On most occasions, I can stand less than I minute before experiencing orthostatic symptoms. Scores of 9 or higher suggest orthostatic intolerance. Though this quiz uses a score of 9 to suggest orthostatic intolerance, I consider a score of 7 or higher to be suggestive in those with fibromyalgia. Yet another simple test for orthostatic intolerance that you might want to consider is the "NASA 10 Minute Lean Test." You can read instructions for this test here. The simple treatments below can markedly improve function in those with orthostatic intolerance. Although any or all of these treatments can be combined, you should begin them in the order listed and work your way down as needed. I know. You probably already drink like a fish. But you probably also pee like a race horse! This is because one of the hormone deficiencies in OI is antidiuretic hormone (vasopressin, the "anti-peeing" hormone), which leaves you dehydrated. In addition, salt is the "sponge" that holds water in our body. You need to eat eat large amounts of salt, sometimes even licking sea salt. You can do this by simply licking salt poured into the palms of your hands. You probably notice that your body is craving salt. Ironically, sometimes in an attempt to be healthy, many of you overly restrict your salt consumption. That misguided advice is a good recipe to crash and burn. It's remarkable how much improvement many people see by simply using medium pressure (20-30 mm) compression stockings. You should use ones that go at least to mid thigh (or at least knee-high). You should wear them during the day when you're active (not when you're lying down for extended periods). Although inexpensive, these first two treatments are remarkably helpful. Wearing something that constricts the abdomen, such as a corset or a girdle, can also help. This is a critical part of retaining salt and water. Some people benefit from a prescription of low-dose hydrocortisone (do not go over 20 mg daily). In addition, natural adrenal support with Adrenaplex® or Adrenal Stress End™ is a good way to optimize adrenal function. Taking 0.1 mg of Florinef each morning can be helpful (it's most helpful in those under 20 years of age or those with more severe OI). Taking 1-2 tablets of 0.1 mg DDAVP (basically vasopressin or antidiuretic hormone) once or twice daily can also be quite helpful. These replace the hormones that are low because of the hypothalamic dysfunction. It takes six weeks to see their effect. Rapid shifts in fluid levels can trigger headaches and migraines in some people. If this happens to you, slowly raise the dose, increasing by a quarter tablet every 1 to 2 weeks. The medication midodrine (ProAmatine) 5-10 mg twice daily (morning and early afternoon) can be fairly helpful after six weeks of use. But do not use the medication after 5 PM, or when lying down, as it can drive blood pressure too high. Lower the dose or stop taking it if it causes your blood pressure to rise too high or you feel like you're becoming shaky. Gradually increase the dose to a maximum of 10 mg three times daily, with the last dose at 4 PM. Prozac, Zoloft and Dexedrine have all been shown to help autonomic dysfunction. Some people find that a gluten and milk-free diet is also helpful. Though the preceding advice is listed in summary fashion, you'll find that it will serve you very well clinically. But there is much more to the story. If you're interested in a bit more of the science, read on. Excellent research by Dr. Mark Sivieri in Maryland shows that many people with fibromyalgia are showing IgG1 and IgG 3 antibody deficiencies (deficiencies in our body's defense function) on blood testing. This contributes to immune dysfunction. But research and clinical experience are additionally showing that these immune deficiencies are also associated with Small Fiber Neuropathy, which is common in fibromyalgia. This is one of many factors contributing to pain, and also seems to cause a "shrinking" of the nerves involved in autonomic function. Studies show that treating with IV gamma globulin can actually result in regrowth and recovery of these nerves, helping both the small fiber neuropathy pain and autonomic dysfunction. We have found that IV gamma globulin is very beneficial in a small subset of the most critically ill people who have fibromyalgia and OI. These are people who are often housebound and bedbound. It's important to start with a low dose of gamma globulin and work up to the half gram per kilogram IV each three weeks. Otherwise significant Herxheimer (infection die off) reactions may occur. Treatment benefits, often dramatic, usually begin at about four months on the optimal dose. Treating OI can be expensive, and getting insurance coverage for this can be difficult. If you'd like help guiding you through the process of getting insurance authorization for this, I invite you to contact Denise Haire from my staff (office@EndFatigue.com). Denise does an excellent job and I highly recommend her. Addressing the autonomic dysfunction and orthostatic intolerance seen in fibromyalgia can be fairly simple using the Orthostatic Intolerance Quiz for diagnosis and the list of treatments I described. In combination with the rest of the S.H.I.N.E.® protocol, and even done on its own, the clinical benefits can be marked. Download this 27-page information sheet for a superb document on orthostatic intolerance written by my favorite OI specialist, Dr. Peter Rowe at Johns Hopkins. Fibromyalgia can be effectively treated. And you now have one more easy and powerful tool in your toolkit! It's time for you to get well NOW!